The Here to Dream beach house is located directly on the sugar white sands of the emerald waters. Looking out across the Gulf, this dream home will provide the most incredible views along this perfect and private beach. From inside the house, and from both decks, you can see to the east and the west as far as the eye can see. This is the best view of any property on the beach. The pristine sandy beach offers miles of options for walking, shelling, running, jogging, crabbing, swimming, snorkeling, paddle boarding and kayaking. 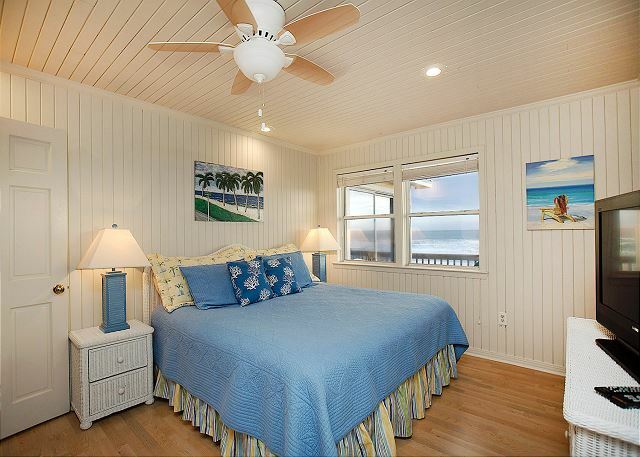 This 2000 square foot oceanfront beach house has a combination of classic and traditional beach charm. The upper and lower decks allow guests to take advantage of the cool sea breezes, beautiful sunrises and breathtaking sunsets. All while drinking your morning coffee, a tall glass of lemonade, or a glass of wine. The decks will bring you endless hours of quality family time or a relaxing atmosphere to enjoy your favorite book. Once inside Here to Dream, the modern-laid back décor sends a warm invitation to our guests. It welcomes them with bright vivid colors schemes of reds, blues and greens across an airy living room. The wall of tall, glass panel windows provides you with a constant view of the ocean. The kitchen creates a beach cottage vibe and comes fully loaded with everything you need for entertaining. The spacious, classic white dining area has a separate sitting area, sliding glass doors for beach access and more incredible views. This beach house has four bedrooms and can sleep up to fourteen guests. The Master has a King size bed. The first guest bedroom has 1 Queen size bed. The second guest bedroom has a King size bed. 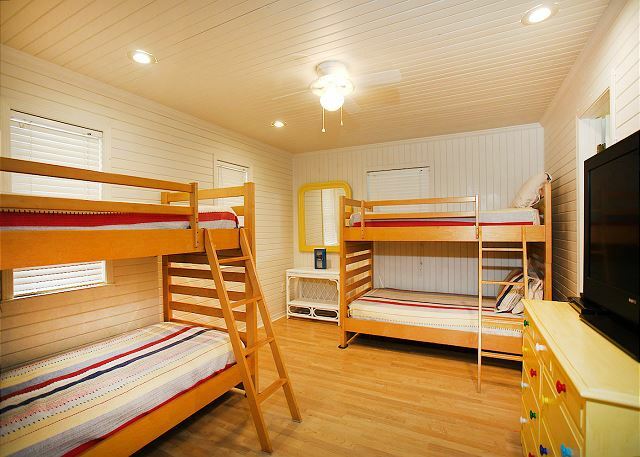 The third guest bedroom contains 2 sets of twin bunk beds and the living area has 2 Queen Sleeper sofas. 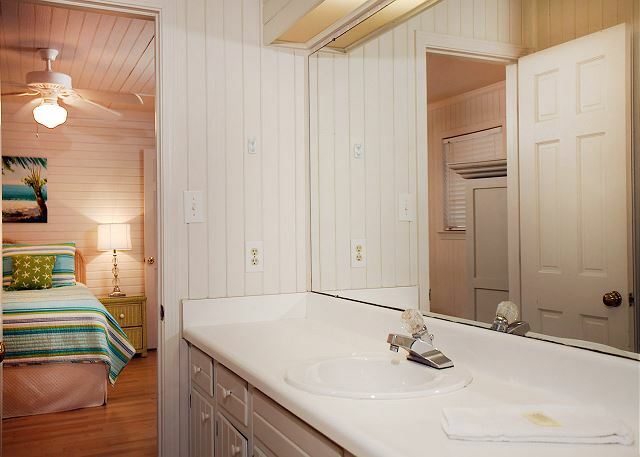 Each bedroom has a classic nautical beach house vibe. The home has 3 bathrooms. If you need extra room for entertaining or just want a place to engage in thought there is an additional lower floor under the house that includes a swing and a picnic table. All our properties are professionally cleaned and maintained (please check our reviews). Our Property manager-Demetri has a wonderful reputation with our all our guest. If you need anything day or night he will go the extra mile to accommodate all your needs. Here to Dream can make all your dreams come true. So close to the water it is a total surreal experience. If you are planning the perfect family vacation or a beautiful beach wedding this is YOUR destination. This charming coastal town with it’s something for-everyone mentality has become a favorite spot for families gathering each year. Not only is it a great summer destination, it is also a great fall and winter destination. 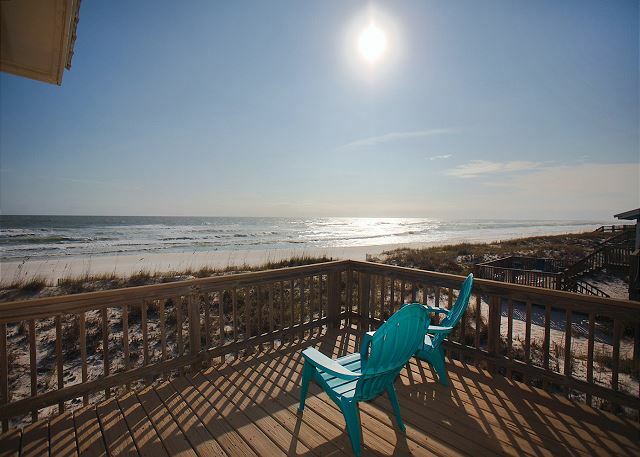 Gulf Shores has everything to offer for your dream vacation, family reunion or needed getaway. The coast not only treats you to beaches and water sports, it also has incredible boating and fishing opportunities. It has some of the best surf fishing in the area. There is pier fishing, or charter a boat, and fish the largest artificial reef program in the country. We will be happy to provide you with useful fishing information for your stay. If you want to do some amazing sight seeing, spend a day on one of the many dolphin cruises. You may want to discover a whole new world under the surface of the Gulf of Mexico. Try diving and exploring The LuLu, a sunken freighter, or investigating the fishing reef up close. If you want to explore from the air, take a helicopter ride with Orange Beach Helicopters or grab a balloon ride and get a new perspective of the island. It is AMAZING! This was our family's second stay at Here to dream. And just like the first time everything went flawless. We frequent the Gulf Shores area and have lots of experience with other properties and had no problem coming back to this property for a second time knowing between the house and the property manager Mitrie we would be taken care of. We like the location of the house being down a ways from town and away from the condos giving you almost a completely private beachfront that incorporated with the closeness of the house to the ocean makes it hard to leave when the weather is nice. Has before nature was there with a key lime pie and to answer any questions for us we had and give plenty of suggestions local activities and restaurants. Cleanliness of the house and upkeep seem very satisfactory we're fortunate to catch some great weather. If you're looking for privacy lots of beach time a comfortable house with lots of room we highly recommend this property. This house is lovely. It had everything we needed and had beautiful views of the beach. We loved walking straight out into the beach from the home. We will definitely be back again. If you are looking for peace and tranquility at the beach, this home will be your ticket! Location is perfect. Very quiet, your own private beach and gorgeous sunrises every morning from the dining room table and views of the ocean all day. The home was comfortable and had adequate space for our family of nine and the kitchen was stocked well. Demetri was excellent to work with and even left a welcome gift for us! The only things that I would add as a “needs improvement” would be that it is due for a deep cleaning and new mattresses would be great. Deep cleaning such as the floors were really in need of sweeping out from under the beds (I always look for items that might be left) and the baseboards were in need of cleaning. I should say that I am a “clean freak” and notice details that many wouldn’t however. The rest of the home was cleaned well such as bathrooms and kitchen and we were very comfortable. If we go back to Gulf Shores then we would definitely stay there again! We had a wonderful experience in the Here to Dream house over spring break! This house had plenty of room for our family and the view from the family room was amazing! House was clean and fully stocked with everything we needed. Loved the Key lime pie waiting for us on arrival. Great hospitality, awesome service, amazing views = a perfect vacation! We will be back for sure! We've stayed here several times and enjoyed it every time. If you have issues or questions, the property manager, Metri, responds quickly to phone calls or texts. 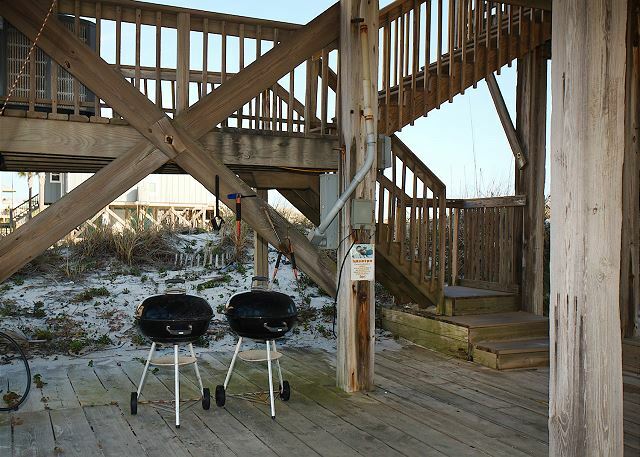 The property is located away from the hustle and bustle of the main part of Gulf Shores, so it's always quiet and tranquil. Even with seven adults in the house, it's roomy enough to not feel over crowded. As an aside, the HVAC system works flawlessly, which is important as the temperatures varied from the mid-80s to the mid to low 30s during our stay. We'll be returning. Great place and great manager. Had a wonderful time. Great home in a fantastic location. Property manager is delightful to work with. You will not be disappointed! HERE TO DREAM is perfect for us!! We were 5 adults and 5 children under 6 enjoying this property 100%. It was our third year. The rate is very reasonable, the property is perfect for us and Metri is always a "guardian angel" and he is quick to respond to any issue. It feels like home. A great but functional "older" beach home but as close to the beach as they come which was very nice. But it had everything we needed and the property manager ("Uncle" Metri) was incredibly helpful and thoughtful (checking on us multiple times during a one night tropical storm.) A very positive experience for all of our family! The house was clean and in good repair when we arrived. It was plenty spacious for three families with kids. Booking, check-in, and check out were as easy and can be and Mitri was very easy to deal with. Will definitely consider working with these good people again when we return to Gulf Shores. 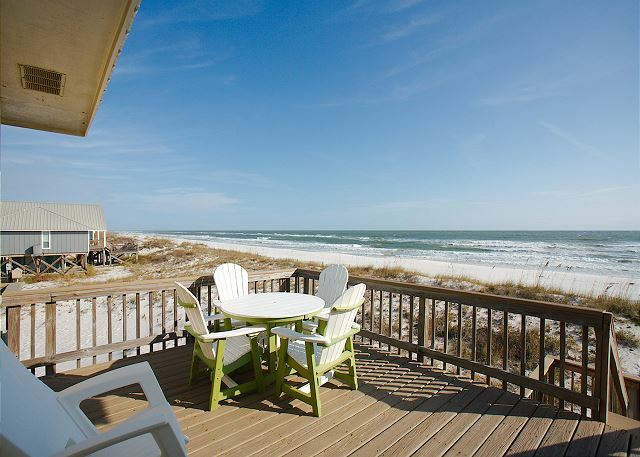 It's right on the beach facing the Gulf and has a wonderful view of the water. The open plan living-dining- kitchen is airy and spacious. One of the best things is the big table in front of a wall of windows where the group can eat, play games, and visit and everyone can find a seat. The four bedrooms and three full baths were fine for our family of 8. The kitchen is well stocked and all appliances worked well. The location is far enough from town that the beach is pretty quiet and almost feels private which our family appreciates. There are three decks and a floored area under the house with a picnic table and grills. The manager greets guests upon arrival and is very helpful. The air conditioner works great. This was our second year to vacation here. We were pleased with our stay at HereToDream. The accommodations were fine for our extended family of 6 adults and 6 kids. The bunk room became kid central. The location was superb; so nice to just walk a few steps to the beach. Metri was responsive to needs and gave suggestions. Brought in cooked seafood from S&S was super!! Everything in the house was as expected. It was a wonderful experience. The house was everything we imagined and more. Plenty of room, open space and very secluded beautiful beach. We were there during the music festival at the hangout and it was a madhouse at the "T". That's the beauty of being on west beach, you don't have have to get in that mess unless you choose to. I will definitely be back. We stayed at Here to Dream and it was a perfect place for my family. There were 7 if us and there was tons of space, very easy access to get to the beach and very secluded from the hustle and bustle that you get when yo stay in the condos further down the strip. We had our own little stretch of beach to enjoy for an entire week. Metri was very helpful and offered some suggestions to help us make the most out of our stay. We had a blast! The house was great, large enough, clean and right on the beach and the ocean! Made us smile! Also, Metri, property owner, made the trip that much better! He was very helpful, knowledgeable and soooo nice! Thank you for everything! We stayed here in January and loved this house! The furniture is very comfortable. The kitchen is well supplied. The property manager is quick to help with any concerns. The views and beach are spectacular. It is a convenient distance to stores and restaurants. I highly recommend this rental! Had a great time with family and friends!! We've stayed in Here to Dream five times and really enjoy it. The house is far enough away from the main drag that it's always peaceful. Since we stayed during November, we had the added benefit of watching the Blue Angels practice. The Property Manger, Metri, is a pleasure to deal with and is quite responsive. We've already made our reservation for next year. This house is perfect for what we needed - a nice house to get away from it all. Our bed was comfortable and I love stepping out the door and being on the beach! The key lime pie from Metri is always appreciated! What a great place! It gets harder and harder to leave. We rented Here to Dream and the house next door, Change of Pace, for a wedding. The two houses together were perfect for the families, wedding prep and the reception under the houses. The short walk to the beach for the ceremony was beautiful. Both houses were stocked with everything we needed in the kitchen. Beds were comfortable and the houses were very clean. We definitely renting one or both of these houses. We could not have asked for anything better suited to our needs for this trip. And Demetri was amazing! It was home away from home. We all fit very nicely. Plenty of space. Everything worked super well. The underneath was very spacious. We cooked inside and out. The house was perfect. We loved this house! Perfect for a family vacation. Especially the 3 bathrooms. Plenty of hot water and excellent air conditioning. Metri is just as terrific as the other reviews said!! The place was clean and bright with lots of room for 10. Its close to the beach so you don't have very far to drag your canopy. There is a shower and a hose at the bottom of the stairs which is convenient for keeping sand in the house to a minimum. We also loved the location. 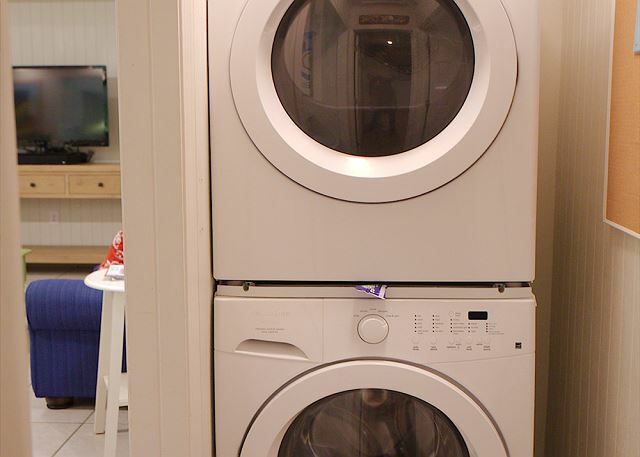 The property manager Demitri made us feel right at home. Thumbs up! Here to Dream was a dream come true. Lovely house on gorgeous beach. Metri as always was extremely helpful. We loved the new ice maker--a great surprise!!!! The house was clean and comfortable. The location is good. Everything was as advertised. Mitri was very friendly and helpful. We enjoyed our stay very much. This beach house was great for a family vacation with 6 adults and kids. Right on the beach and away from the crowds. We enjoy cooking and prepared all of our meals at the house. Kitchen was well equipped and grills were available. Dining room table overlooking the beach is large enough for the whole family. Bedrooms roomy and comfortable. Property manager is very helpful and responsive. These are wonderful people to stay with. The house was just perfect and you can't beat the location!! Very nice and quiet area, my sisters and I had the best time. Metri meets you at house and even has a wonderful Key Lime Pie. He also helps you find places to eat like the Flying Harpoon which was awesome!! We will be coming back every year!! Wonderful stay and experience with Paradise Gulf Properties. Demetrious checked on us throughout the week, spoiled us with Key Lime pie, beautiful shells for grandchildren, helpful with places to visit and eat. The property was beautiful just like the pictures, right on the beach, loved underneath shaded play area under the house. Loved the swing, picnic table, grills, and even toys and games for the kids there. I would highly recommend this property. I have already sent info to family and friends that have asked about our stay . Would love to go back , beach is very private and beautiful, grandkids enjoyed every minute and did not want to leave. Perfect for all ages. We chose this house to celebrate a week with my family for my parent's 50th Wedding Anniversary. It was a perfect location on the beach. Very peaceful and private, yet just a few miles from restaurants / shopping. Not as congested as other areas on the gulf. We will definitely be back! It was an excellent family spring break location. The house was spacious, clean well laid out and kid friendly. The decor was very fun and "beachy". The location is excellent and the beach was beautiful and not at all crowded. We could sit on the deck and watch the kids playing in the sand, close enough we could talk to them without shouting. We will definitely be back! Thanks so much! I pieced a quilt while listening to the ocean and watching activity on the beach. It was warm so was able to open windows many days. Early morning walks on the beach were also very nice. The property is in a great location and the home is wonderful. but a few things need some attention. fix the board under the home, make sure your cleaners pay attention. A few utensils still had food on them. There are a few rails on the decks that need repair. Pick up the grounds. old garland laying around and a broken brick. REPLACE the BBQ utensils . They are hanging out side and are rusty. No one should use these. Bottom drawer of dresser broke. But as I said these are small things that would take no time to fix. We would of rebooked but we need a bigger home with 6 bedrooms. Stay here as I'm sure they will repair these things. Once again a fine property! This is why we keep coming back. This is the third year and look forward to next year. Metri was attentive as usual and consider him a friend. Here to Dream...and we did. This great place was as advertised and more. No coastal beach house is closer to the water and none has a better view. Metri, the manager, was competent, responsive, informative and charming to boot. If you come to stay, don't pick our week because we're coming back! The house is spacious and very clean and right on the water. The beach is fantastic. It doesn't get any better than this!! 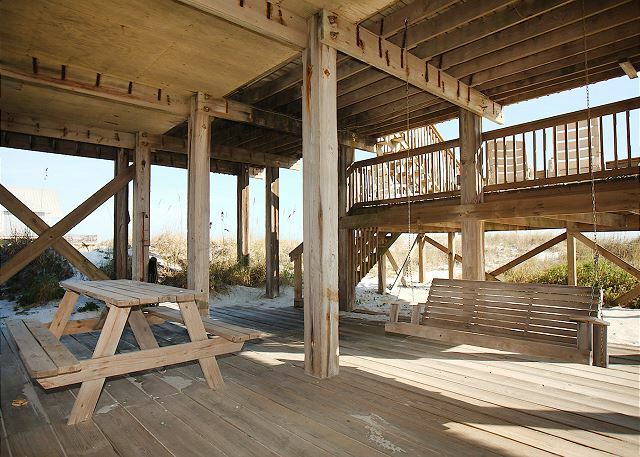 Location of this house is perfect--you step out the back door right onto the beach. Outdoor porches on both sides of the house and on the lower level mean there's tons of areas for relaxing in the sun or shade. The house is very comfortable and has incredible views of the water from the living room. Kitchen is fully stocked with appliances/pots/pans, the table is nice and big to accommodate everyone, and all the usual amenities are in place (t.v, dvd player, wifi). Metri is attentive and available to make sure your stay is perfect. This house will not disappoint-we would absolutely stay here again! Our family loved staying in this house! The beach is amazing! 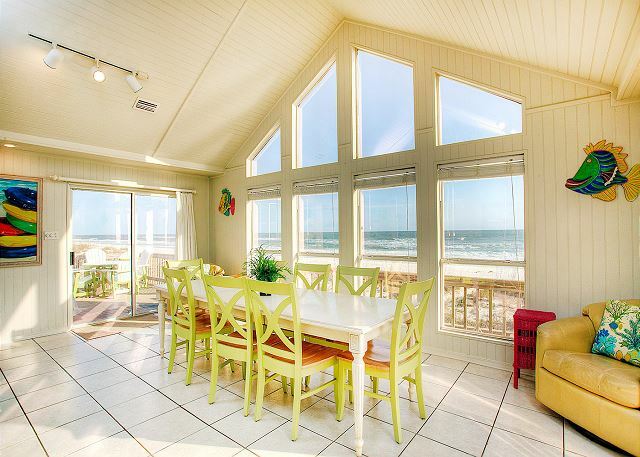 The house is beautiful with all of the windows and beautiful beach views. The beach was not crowded at all. Overall highly recommend this property! Family Vacation Again big Hit!!! Our family(11people)4children,6 adults, returned to enjoy family time together. Once again we enjoyed the beautiful blue waters of the Gulf, and the spacious home that fits our family perfectly. The view from the dining/family room is spectacular,and the water always so inviting. We hope to return in the near future. This home is aptly named. It is our "Dream" come true. We had a wonderful week!! This is a beautiful beach and our daughter's wedding was perfect!!! Metri was very helpful and super nice!! Our stay at Here to Dream was just that; a dream! Kitchen was beautifully appointed, everything was there! There was plenty of room for the kids to spread out and play. Demetri was just a phone call away if we needed anything, and was super friendly! Overall, a vacation to remember! Our family enjoyed this beach house. We had a wonderful week and the property manager was very helpful anytime we had a question. We had several adults and two babies on our vacation. This house fit all of our needs! We were able to cook and hang out in the open den all together without being cramped. The house was great for those with kids. It was perfect to just walk right up the private stairs at nap time. The kids loved the swing under the house. We saw crabs, dolphins, and a sea turtle that laid eggs two houses down. It was an awesome experience and we are already talking about next year's trip! Had a great time as usual. Everything was just perfect! Our daughter was married on the beach at Hear to Dream. Demetri had everything ready for us, including the under decking of the house pressure washed clean where we had our reception catered. The best property manager ever.! Thank you Paradise Gulf Properties for allowing us to give our daughter her dream wedding. We had a fantastic week at "Here to Dream" located right on the beach. It's an awesome location away from crowds and so close to the water for our many trips back and forth with young children. The house was very clean and spacious with great views. Demetri was a pleasure to work with and very helpful. Thank you Demetri. The best thing about this house is its location right on the beach. The main living area has a wall of windows with fantastic views that seem to go on forever. on our last night there was a bad storm bad even that was really cool to watch from the safe indoors. It's well supplied for your needs. Demitri is very nice/ helpful. This was a perfect vacation. The house is wonder and decorated in such a cute beach theme. It fit us to a T. Demerits was a joy to work with. The stove wasn't working and he was there in a flash to fix it. I would totally stay here again! We had a great time. Our grown grandchildren came along with our children. The house was very nice and clean. We left it in good shape. Thank you. 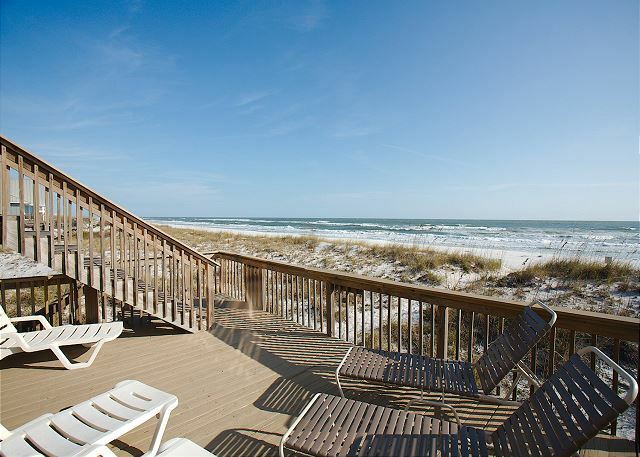 A great beach vacation stay!! Here to Dream is a great place to stay at the beach. The house is right on the beach and has all the ametities you would want for a beach house. WE LOVED IT!! Here To Dream is a great beach house. The advertisement accurately described the house, the local contact was responsive and very helpful to all request, the house was clean and well maintained and we had a great time. We had a family outing, 6 adults and 4 children, for a week and would use the property again. The Here to dream home and Demetri made our vacation fantastic. We will be visiting in the future. The location of the house is beyond fabulous, steps from the beach. The house was the perfect size for us, super clean,and equipped with everything we needed. The property manager Metri is always helpful and offered a great suggestion on where to get a very tasty low country boil. One of my favorite features is the privacy of the beach. . Definitely plan to return to this great beach and beach house. We were so HAPPY with condition of the property, it was exactly as pictured in the description. We were so close to the water!!! We unfortunately had a little remnants from Hurricane Patricia, but actually was interesting witnessing the BIG WAVES... You couldn't ask for a better Property Manager, he is the BEST !!! Vacationing on the beach in October was like having the beach to ourselves. Once again we were not disappointed at "Here To Dream". Metri, the manager, was always available to help if necessary. What a wonderful stay we had at Here to Dream! Metri, the property manager, was available to us for any questions, he brought a key lime pie to enjoy, and gave us great advice on places to eat, dolphin cruises, and how to rig a line to catch pompano! The home was the perfect size for our group of 8. Spacious enough for several couples, it had everything we needed in the kitchen and baths, boogie boards and goggles under the deck so we could head on out to the water when we got there. The view from the living/dining area was incredible! We watched dolphins playing in the surf on several occasions, caught fish from the beach, watched the sunrises, the sunsets, the lightning displays, and the waves from the 3 separate decks. Enjoyed the porch swing and the breeze under the house with its really large deck where we bbq'd. Except for a few very minor details, this home was absolutely perfect! It's located about 6 miles out of town, away from any crowds. The only negative thing to say is I wasn't ready to go home when the week was over! We are definitely coming back!!! Our rental experience was wonderful. The house exceeded our expectations. It had a spacious living room and every morning sitting at the table eating breakfast we saw dolphins. 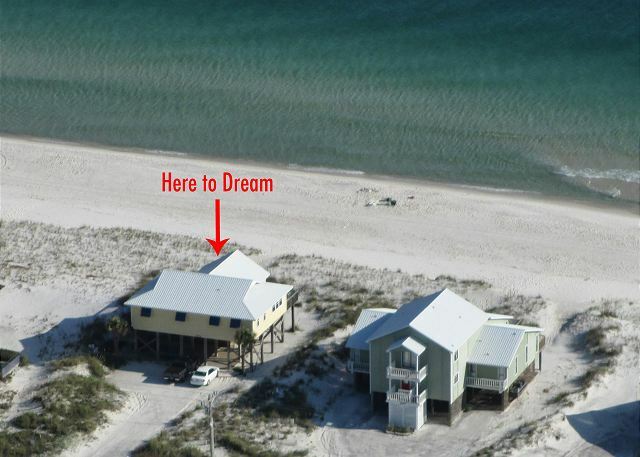 We would definitely recommend Here to Dream and will stay there again when we come back to Gulf Shores. The property manager stopped by upon our arrival and gave us recommendations for restaurants, etc. and explained house features (how to turn on tvs, etc.) which was a very nice touch that was appreciated. This was the first time our family of 7 ever rented a beach house. We loved Here To Dream. The location is the perfect distance outside of town. Demetri was so helpful. We would totally stay here again. Perfect family getaway! We had our daughters meet us at Here to Dream. One flew in and the other drove in with her husband and 20 month old baby girl. It is a great place just to relax and enjoy the quite peaceful sounds of the waves on the beach. Our granddaughter loved the beach and playing in the sand. My mother came with us and it was perfect for all ages 20 months to 75 years. The windows were perfect views of the beach, the house was comfortable and meet all our needs. Thanks Demetrious for tips, suggestions and the Key Lime Pie! We visited Here to Dream with another family. The house was perfect for our group. The house was clean, well equipped and perfectly located right on the beach. Demitri was very helpful, and we all enjoyed the key lime pie we found in the fridge upon arrival. I would definitely suggest this house to friends/family and would stay here again. Fantastic. Great House, Great Beach, Great time! As it was the last three years, 2015 proved a very enjoyable experience for our family. The house was as great as always and we had the good fortune of fantastic weather all week. We have stayed at Here to Dream for 5 years now, it is the perfect beach house for our family. All you have to do is get up and your within yards of the beach. This year we celebrated our 40th anniversary there with a renewal of our vows on the beach, had the grandkids in the ceremony along with my sister-in-law and her husband who stood up with us the first time. What a wonderful day it was. We also enjoyed fishing every morning, caught a stingray,flounder, lady fish , and many more,also saw Dolphins,Sharks (3" long) big enough for my wife and kids. We will be back. Love coming to our little Here to Dream getaway! Fell in love with Gulf Shores West Beach Blvd. We had a wonderful stay at Here To Dream. Couldn't have been more relaxing or beautiful. Will definitely be staying again. Thanks to Demetri! We're already planning our next stay! Great location and facilities. Metri, the manager, was very responsive in addressing a couple of minor issues. You can't ask for a better location...the five us, two adult couples and a friend, plan to make staying in Here to Dream an annual event. Had a super time and "Metri " really shows you true southern hospitality. Great place. Right on the beach. Wonderful week at Gulf Shores during Christmas, especially since we stayed at "Here to Dream". Right on the beach, Here to Dream is an ideal beach house with wonderful views. The living area is spacious and inviting. 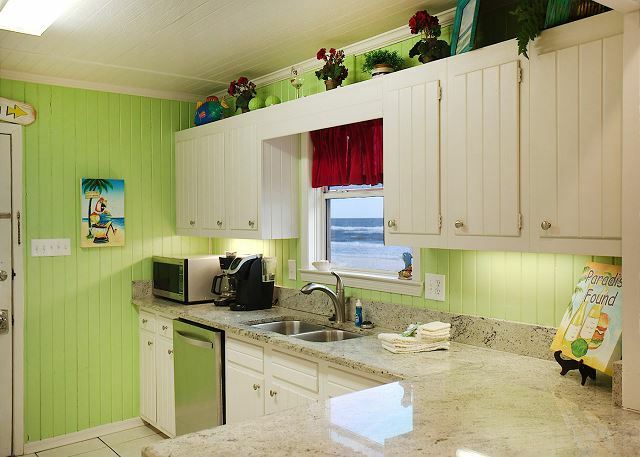 The kitchen is well appointed with a great view of the beach. Be sure to carve out some extra time when the property manager, Demetrious (Metri), comes by. He'll fill you in on local shopping and dining, give a you a bit of history, and tips on how to make the most of your visit. We liked it so much, we're already planning our return visits. Not much more I can say but Great! The house was very clean and the best outfitted of any rental in 15 years of going to Gulf Shores. The manager was very friendly and helpful although nothing was needed. We will definately return!! Very cozy and clean home, we didnt want to leave. Our family of five came down for a few relaxing days. Demetri was very quick to respond to any questions we had and was very pleasant and accommodating both before and during our stay. Great house; weather was with us and beach enjoyable! Our family of 5 adults and 5 grandchildren had a fabulous time in Gulf Shores and staying at the Here to Dream property. It met our expectations 100%. Right on the beach, washer and dryer priceless, grandkids LOVED the bunk bed bedroom!! Everything was in working order so no complaints whatsoever. Shower right below the house was extremely useful to give the grandkids a washing and shampooing when coming from the day in the waves! We loved our stay and would recommend this to any family thinking of booking Here To Dream. One note is the bedding could be updated somewhat. White sheets not so white anymore and pillows not very good. We had a wonderful time at Here to Dream, the beach was right off the steps making it incredibly convenient for fishing and walks on the beach (even with an infant that couldn't go out during the heat of the day). It was close enough to see each other when one was taking a turn on the beach and trade off so we both got time inside with the baby and outside in the sunshine! Close and convenient to shops, restaurants, etc, but we mainly just stayed at the house- we didn't feel we needed anything else! The manager, Dimitri was wonderful to work with- I'd recommend the place (and any place Dimitri rents) for ease of rental and hospitality. As with most beach rentals, there was a bit of mold around some of the vents and the occasional piece of furniture that was a little creeky, but overall everything was comfortable, bright, and well maintained. We didn't feel like we needed anything else- already thinking we'll email to reserve again as soon as we find out when we get vacation! This is the fourth time we have come down to the beach house and each time it gets better! The improvements to the house have been amazing, and we are always excited to see what has been done. This is the first time we have vacationed in July, and we were pleasantly surprised to feel cooler temperatures and see crystal clear water. We truly enjoy the house and have come to think of it as our second home. We cannot wait until next year when we can come back and make more beach memories. Thank you Demetri for always going above and beyond to make our time so comfortable... And for always satisfying our sweet tooth with key lime pie! It was a great family reunion. The grandkids enjoyed the bunk beds and the view from the great room was perfect. One granddaughter caught a flounder, Grandpa filleted it and cooked it for the kids. They loved eating the catch! One day all the kids went to The Track Family Recreation Center. They enjoyed the bumper boats and go-carts. There was an early bird special, 1/2 price tickets. That helped with the cost. Most of the time we were all on the beach. It was a blast ! Metri was very helpful and the Key Lime pie was a special treat! Our family just enjoyed a fabulous week of fun and relaxation. There were 6 adults, and 4 children ages 2-7. We had plenty of sleeping space, and the large family room overlooking the beach was perfect for relaxation. We ate our breakfast at the same time the dolphins did, and we looked forward to this added entertainment each morning. The beaches were clean, water warm, and we were able to walk out quite a distance in the water before it was deep. This was comforting to know with small children. The house and grounds were clean and charmingly decorated. We had the added bonus of watching the fireworks from the convenience of the deck, while we sipped frozen drinks. Demetri was so great when we had questions, and he made sure that all our needs were met. We are telling all our friends about our family vacation, and our neighbors are already thinking of renting "here to dream " next year. This was our third year at Here to Dream and we have been extremely happy with the house each time. It fits our needs perfectly and is in a fantastic location. Dimitri is always very helpful and available to meet any of our needs. We love it and are planning a fourth trip next year. It was really really fun! I always have the best time at the beach and look forward to it every year.--This comment is from one of my 4 grand-kids and each one feels the same way.We always have a wonderful family vacation. Over all, we had a great week. We all loved the vacation. Great house and view right on the beach. This was our 2nd time at this property. We love it, super house,great beach and view. Best of all is Demitri the manager. He is the most hospitable manager in the world. Just ask for it and he comes thru. We are coming back next year. Beautiful beach home, with everything you need for your stay. This was my families first trip to the gulf for vacation, and we are already looking forward to next year. You are so close to the water it's almost surreal; the days were spent enjoying everything Gulf Shores has to offer, with a mad dash home to get into the surf. The area under the house is wonderful, you can pinic out of the sun, and the swing is a wonderful place to relax and read a good book. Demetri was wonderful, answering our questions, brought us a couple of outdoor chairs to replace some that were in disrepair, and the family loved the Key Lime pies. We ordered chairs and umbrellas from Ikes for our stay, which made sitting on the beach for the sunset, the most calming part of the day; just a beautiful and wonderful trip for everyone. PERFECT and PRIVATE location! Management (Demetri) was very helpful and friendly. Outdoor chairs are in very poor condition and showers need a storage shelf to put all hygiene items on so everything is not on the floor. Couches definitely need to be cleaned as well. Would definitely go back though! Love all the windows in the living room. Enjoyed the house & it's location very much! We had a wedding at this location and it was perfect!! Dmitri was amazing!! We look forward to staying here again! We had a great time at "Here to Dream" beach house! Demetri was a great host. We couldn't find a vacuum, so he brought us one the next day along with two rugs for the patio doors. Our only complaint is that the floors and sofa weren't very clean (sand on the floor and food under sofas). Demitri took pictures and said he would address this issue with his cleaning crew. This was our second year at Here to Dream. We thoroughly enjoyed the white sand beaches and the water was beautiful. Our house far exceeded our needs. We were pleased at the steps taken to assure that the house is comfortable for everyone. We are looking forward to returning next year. Great location, out of the hub of busy traffic. Great to walk out of house and on to beach. Clean house, lots of room & colorful furnishings. Property Manager very friendly & helpful. Such a relaxing place to be. The house is in a beautiful location. Quiet, away from the condos and hotels. House was very nice and comfortable. I stayed in Here to Dream with 13 others and we had a spacious and relaxing stay. When there was a problem the landlord responded immediately and was very easy to go a hold of. Also the house is so close to the beach and there was not a lot of external noise from neighboring homes.